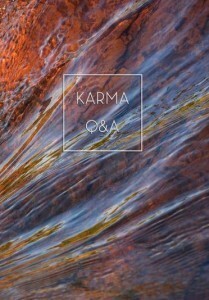 Karma Q&A – a study guide is a newer book (2018) about the concept of Karma as it is understood and used in the Theravada branch of Buddhism. It discusses the origin of Karma and how it might have older roots than Buddhism and what the implications of this for a modern audience in the West might be. The author, Ṭhānissaro Bhikkhu, argues that Karma is not Indonesian cultural luggage adopted by Buddha, but a universal concept, valuable for all cultures. HOLYBOOKS.COM and separately enclosed small donation for the the services rendered to us.